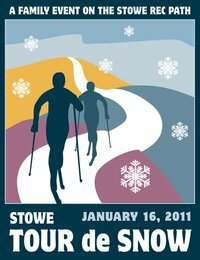 The Stowe Tour de Snow is a fund raiser being put on by a local group called the Friends of Rec Path Grooming (FRPG). For the first time ever the Stowe Rec (Bike) Path will be groomed so it can be enjoyed throughout the winter months. In order to gain exposure and raise funds to support the grooming, FRPG is putting on The Tour de Snow event. It will be held on Sunday, January 16th, 2011 and is designed to showcase the best of what Stowe has to offer winter visitors and locals alike. This is a fantastic concept and I am some what surprised it has not been thought of sooner! The event starts at the top of the bike path; from there participants will ski, walk, snowshoe or run along the path and take advantage of fun-filled activities and stations, sponsored, organized, and staffed by local businesses. The event has mass appeal for individuals of all ages and families!